This is a great new compact Warm White LED Wall Washer with six 3W LED Chips and a smooth silver finish. A 12W max output at 24VDC allows this wall washer to produce clean and bright warm white lighting on walls, buildings, ceiling and signs up to 65ft. This wall washer is able to dim up to 255 levels with proper control. A 23° beam angle and indoor or outdoor rating makes this product perfect for bars, restaurants, clubs, hotels, stages, historical and modern buildings, museums, art galleries or any other project requiring a compact and extra bright water-resistant lamp. 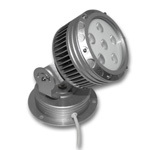 This light is encased in an IP65 aluminum housing making it fully dust protected and protected against minimal low pressure water jet exposure. Tempered glass and stainless fasteners give this light long lasting outdoor use and the ability to direct the light from 0°-180°. 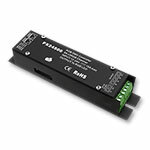 The light can be controlled by a PWM Dimmer or DMX controller using a common anode connection. 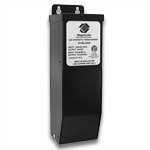 We recommend no more than three 12 watt wall washers connected in a series. An attached 70" water-resistant connector cord is included with every light. For easy connection of wall washers, power supplies and controllers, use the many waterproof connectors wire options. 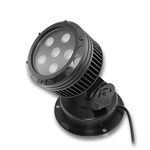 Non-submersible, CE and RoHS approved, 2700-3200K Cool white color temperature. A Mean Well brand IP67 Waterproof 60W, 24VDC LED transformer / power supply recommended for use with our 24VDC LED Strip Lights and LED Wall Washers or any other LED Light requiring a 24VDC Constant Voltage power source. 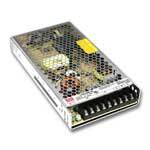 100 - 130VAC input only and a 24VDC, 2.5A output. For wet or damp locations, do not expose to constant liquid, vapor, rain, or sunlight. 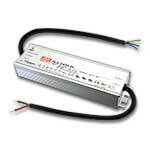 Has one DC output connection to be used to connect our 24VDC LED products to an AC Power source. CE & RoHS certified; IP67, non-submersible, UL recognized. This T or elbow waterproof connector can be used to connect our White and Warm White LED Wall Washers to a 24VDC power source, to a dimmer, or can be used with any other 2 wire LED Wall Washer Connector for simple plug and play waterproof connections. These connectors are 16.5" long with screw down connections, two males and one female. See the link below for a layouts using the T connectors with LED Wall Washers or using them as a waterproof connector. 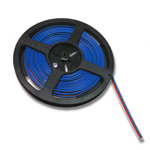 Wallwasher Water-Resistant 2 Conductor Connection wire 80"
This is a waterproof connector with 2 conductor 18AWG wire that can be used to extend the length of the DC connection on our Wall washer power supplies or controllers. 80" long with screw down connections, male on one end and a female on the other end.